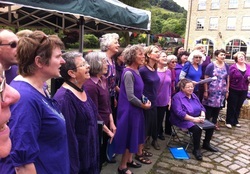 The wonderful Calder Valley Voices are hosting the festival next year - looking forward to seeing you there in Hebden Bridge, 11th-13th July 2014! If you have any info on their whereabouts, do email and we can pass on the contacts for the owners. A message from Raise Your Banners, a festival Cor Gobaith have loved participating in the past few events! 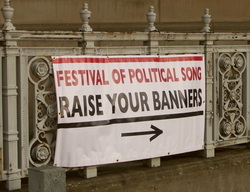 Subject to current funding bids, Raise Your Banners Festival of political song and campaigning arts is planning for a great festival in 2014 and once again in Bradford, West Yorkshire and possibly held on one of the May bank holiday weekends. If the ambitions come off, the Festival will be even more of a resounding success as it has been in the past few years in Bradford with the potential to raise even higher the profile of RYB as an exciting event and Movement. If any choirs are interested contact Keith in Bradford Voices txt 07950 471456. 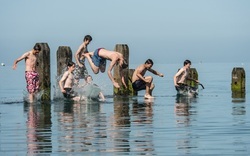 We've all got our fingers crossed this end that the weather holds, that un-named place in Cardigan Bay featured in the papers is where you are heading to, happy sunny, Aberystwyth. We're gearing up for welcoming you! In other news, do check out the update to Ain't Gonna Study War! Registration will be open at the Arts Centre from 3pm on Friday 19th July - can't wait to see you all! Just a friendly reminder that it would be REALLY REALLY helpful if you can get your registration forms to us in time for the booking deadline 17th May! Also, if choir reps can make sure they have sent a description of their choir for the programme by email, that would be great! We're all looking forward to filling our beautiful town with music! If you would like to be involved, please contact Nest on 01974 200932 or via email. Alternatively, email our general event email address with the subject heading 'volunteers'. Mae’r Wyl Corau Stryd yn denu corau stryd a chymuned o dros Brydain am benwythnos o gân. Eleni mae Côr Gobaith yn gwahodd yr wyl i Aberystwyth. Rydym yn paratoi i groesawi tua 30 o gorau a 800 o gantorion. I sicrhau llwyddiant, bydd angen nifer o wirfoddolwyr i’n helpu yn ystod yr wyl, yn enwedig fel stiwardiaid. Byddem yn ddiolchgar iawn am eich cefnogaeth.